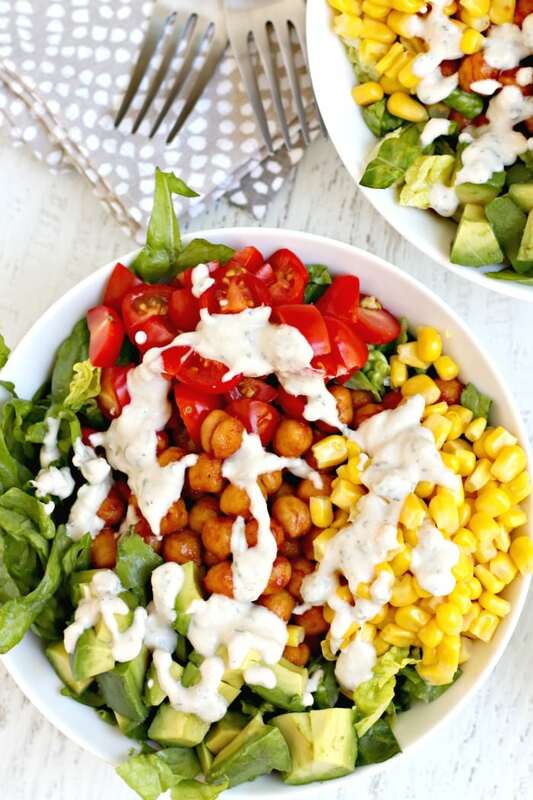 BBQ Ranch Salad with Chickpeas is a vegan, gluten-free and oil-free version of a restaurant favorite. It’s hearty enough for a main meal and is ready in under 30 minutes. After I graduated from college, I thought one of the greatest pleasures was to go to The Cheesecake Factory for lunch. I didn’t know it was a chain restaurant at the time, but the one I went to had an incredible ocean view from the tables. Watching the waves while sipping tropical iced tea, eating as much warm bread as I wanted, and ordering a giant salad was my idea of a great afternoon. And while I haven’t been to The Cheesecake Factory in years, I’ve heard they have a few vegan options now. However, now that I’m older and wiser, I know how to make delicious salads myself that include healthier ingredients and fewer calories and fat. Plus they cost a fraction of the price. Some of my favorites include Tex-Mex Salad, Buffalo Ranch Chickpea Taco Salad and Black Bean Pineapple Salad. And now I love making BBQ Ranch Salad, too. 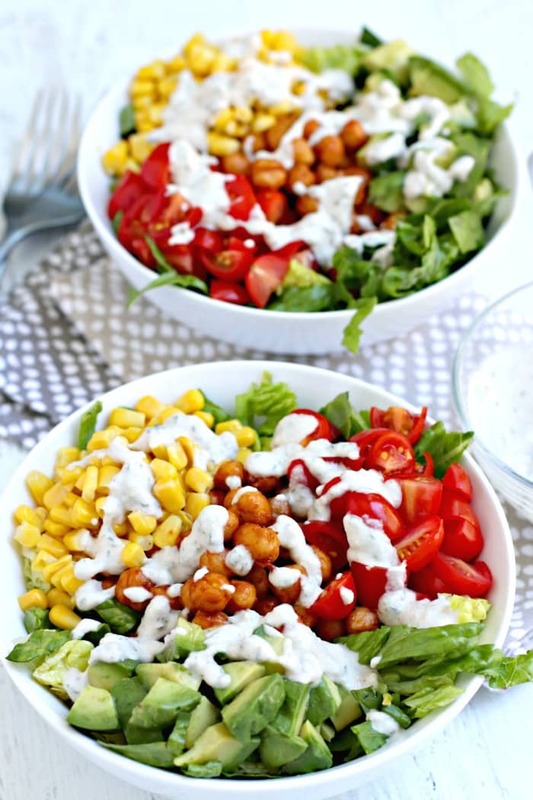 Making BBQ Ranch Salad with Chickpeas is really easy. To make the flavorful pan-roasted garbanzo beans, all you need to do is simmer them in your favorite BBQ sauce. You can use homemade sauce, but I’ve found so many oil-free vegan sauces on the market, I like to take this short cut. And you only need 1/4 cup for a can of chickpeas anyway. But if you do end up with extra BBQ sauce you want to use up, I recommend trying it on soy curls. You can use whatever vegetables you like in your BBQ Ranch Salad. 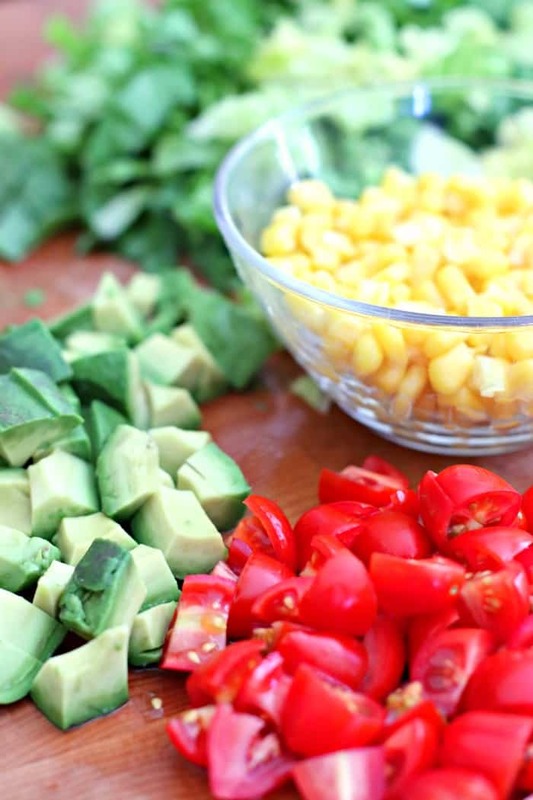 My favorite combination is corn, tomatoes, and avocado. But other options include red or green onions, bell pepper, cucumber, radishes, and black olives. My favorite component of BBQ Ranch Salad is the dressing. I based the recipe on my go-to oil-free vegan Cashew Ranch Dressing. I changed the ingredient measurements slightly to compliment the flavors of the BBQ sauce, and it makes enough to generously dress the two salads in this recipe. But if you love Ranch like I do, feel free to double the dressing so you can use some later. Keep the dressing in a separate container and add it to your salad when you’re ready to eat. It may thicken a little in the refrigerator, but you can add a little water to it if you like it thinner. When you pack your container of salad, put the lettuce on the top. I like to use a glass storage container with a lid and layer the chickpeas, tomatoes, corn, and avocado on the bottom. Then when it’s time for lunch, pour the Ranch dressing on top of the lettuce, put the lid back on the container, then shake your salad until it’s well tossed! 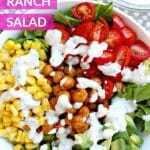 Now let’s make BBQ Ranch Salad with Chickpeas! 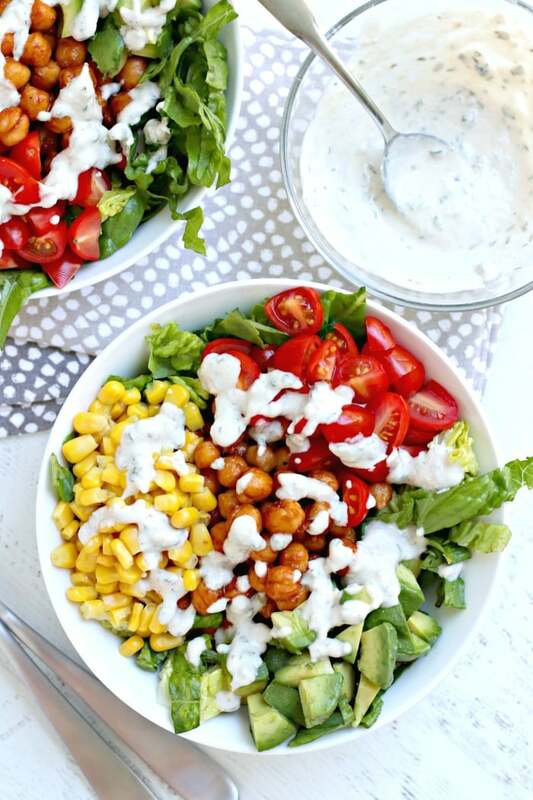 BBQ Ranch Salad with Chickpeas is a vegan, gluten-free and oil-free version of a restaurant favorite. It's hearty enough for a main meal and is ready in under 30 minutes. Prepare the Ranch dressing by blending the raw cashews, water, lemon juice, garlic powder, and onion powder in a high-speed blender until completely smooth. Add an additional tablespoon or two of water, if necessary. Transfer the dressing to a small bowl. Stir in the parsley, chives, and salt and pepper, to taste. Refrigerate the dressing to allow it to cool while you prepare the chickpeas. Heat a non-stick skillet over medium heat (or use a little cooking spray to prevent sticking). Add the chickpeas and BBQ sauce. Stir to coat the chickpeas with the sauce. 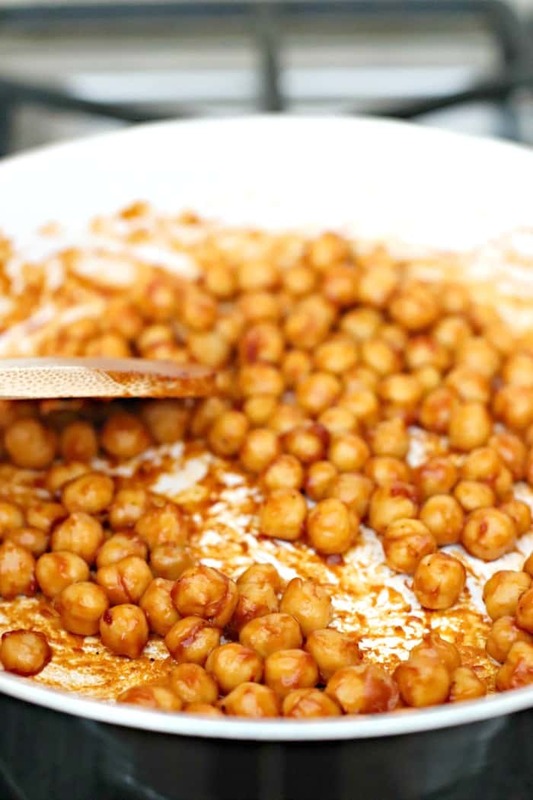 Cook for a few minutes, stirring occasionally, until the chickpeas are hot and most of the sauce has been absorbed. To make the salads, divide the lettuce among two bowls or plates. 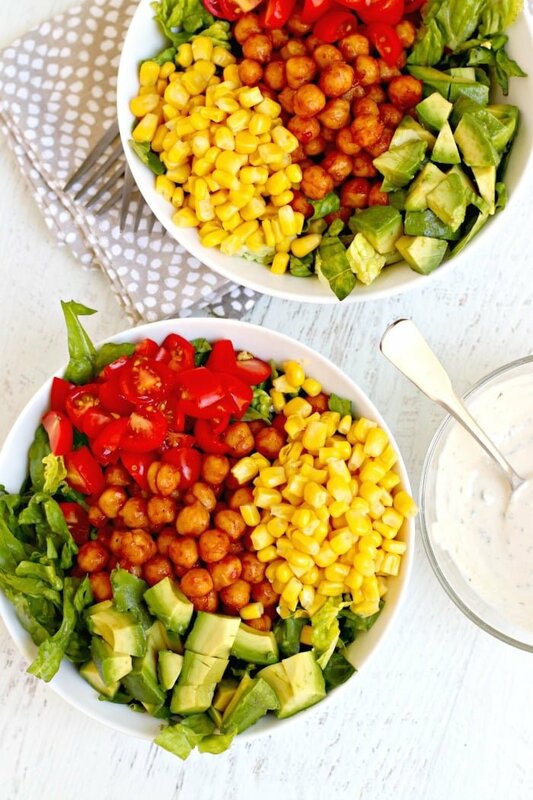 Top each salad with half the BBQ chickpeas, tomatoes, avocado, and corn. 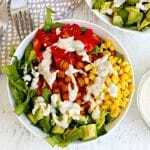 Drizzle each salad with the Ranch dressing and serve immediately. If making this salad in advance, keep the dressing in a separate container and add it to your salad when you're ready to eat. It may thicken a little in the refrigerator, but you can add a little water to it if you like it thinner. I need to keep my sodium low, so I’ll replace the chickpeas, but it all sounds heavenly. It’s such a colorful, healthy and tasty bowl.